How can I change the app wallpaper? You can set a background image for your app in the edit section of the dashboard of the app builder under Design > Background. Depending on which navigation (Visual, List or Tiles) you have selected, different procedures are available. 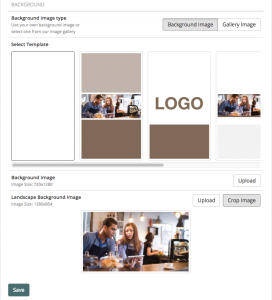 With the visual navigation you can choose from several templates how your background image should be displayed in the app by clicking on the button background image. You can select a template image according to your industry by clicking on picture from gallery. After that, you can crop the background image to your liking. Of course, you can also integrate your own wallpaper into the app under upload. Click on new picture and upload your personal file. You are free to upload images up to 25 MB in size to your media center. Your background image can be in either JPEG or PNG format. The navigations list and tiles show you which optimal image size is used for the background image and whether it may be in portrait or landscape format. For the tab bar and modern navigation there is no background image provided.